For most of January, Minnesota has been in deep freeze. Today is the fourth snow day in the month as wind chills plummet to -40°F. This is definitely the coldest winter I have ever experienced since moving here. Hopefully, this brutal weather would let up soon and spring would come early. This frozen landscape is a stark contrast to the warm and humid tropics of my childhood at this time of the year. My thoughts wander to my native homeland where excitement is building up for the Chinese New Year celebrations. Families are currently busy cleaning and sprucing up their homes. Most of the baking which started 2 to 3 weeks ago is more or less completed. The emphasis this week will be on menu planning for the Reunion Dinner on Thursday, the eve of the new year. Oh, how I miss the festivities! Over the years, I have come to accept the quieter and smaller scale celebrations we have had here with close friends. Still those were good celebrations with both boys home. Now that Ro-Taro is away in college and Ro-Jiro all set to leave this fall, subsequent Chinese New Years will be just another day. Hopefully, in a few more years the boys can take time off to come home and celebrate with Ro-Ri San and me. Until then Chinese New Year will be a low-key affair. That said, I am thankful for little treats like these Yam Nian Gao Fritters that was made possible quite unexpectedly by a good friend. She recently visited Colorado and brought home a nian gāo (年糕/new year cake) for us. I was so excited as it has been ages since I last ate nian gāo. Like many other auspicious sounding foods, nian gāo is eaten because it is a homonym for “higher year”. The word gāo (糕) meaning “cake” is identical in sound to 高, meaning “high or tall”. As such, eating nian gāo has the symbolism of raising oneself taller in each coming year(年年高升 niánnián gāoshēng). For a list of other auspicious sounding foods for the Chinese New Year, please check out my Bak Kwa post. 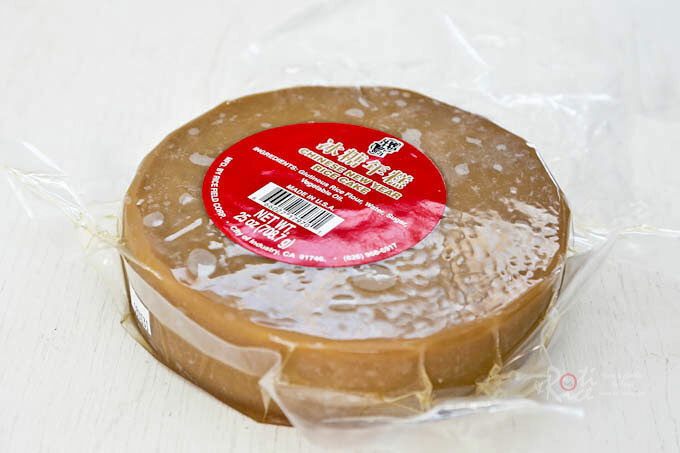 Nian gāo (steamed glutinous rice cake) is made of glutinous rice flour, sugar, and vegetable oil steamed for several hours to achieve that golden caramel color. The longer the steaming, the more fragrant and golden the color. It requires a lot of patience and there is much taboo associated with its preparation which I will leave for you to discover on the internet. Hence, most people prefer to buy than to make them at home. My mom has her “sources” and would pre-order hers ahead of time. The freshly made ti koay, as it is known in the Hokkien dialect usually come still soft in their banana leaves casing. Fresh nian gāo is delicious simply rolled in lightly salted grated coconut. If it has hardened, it can be steamed to soften. 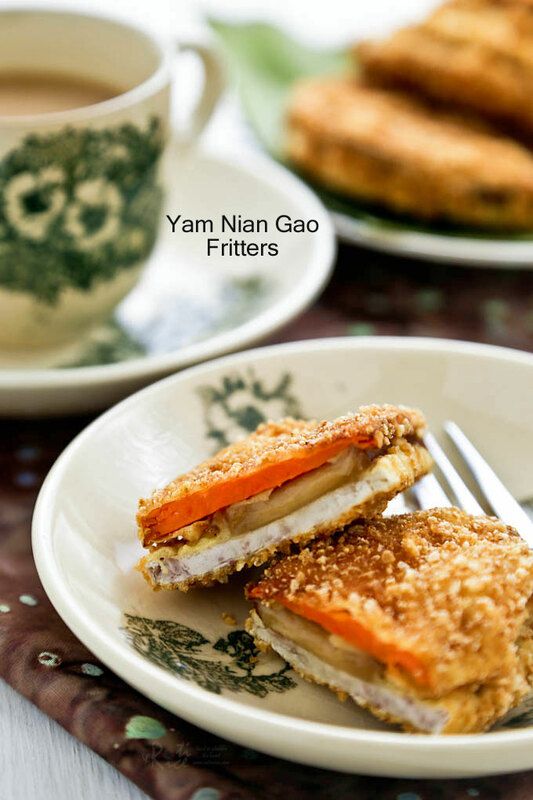 Another way to eat nian gāo is to make these delightful Yam Nian Gao Fritters. 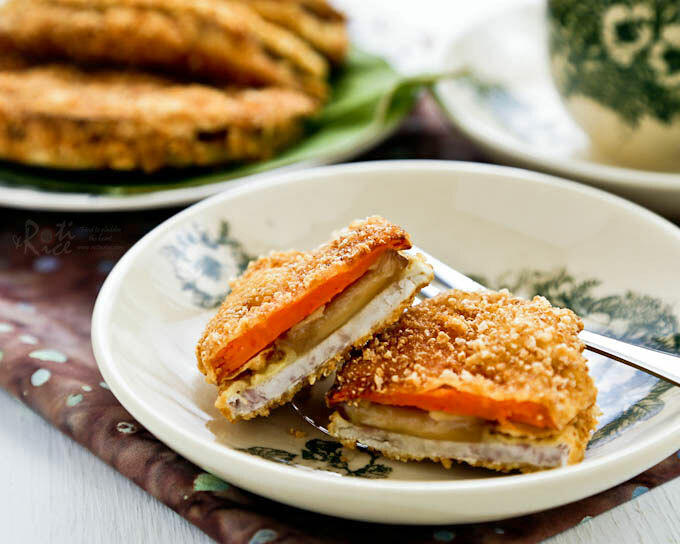 They are slices of nian gāo sandwiched between slices of taro and sweet potatoes dipped in batter. I coated them with crushed rice cereals to give them a crispy and crunchy texture. The batter recipe and method used here is the same tried and tested gluten free one found in the Pisang Goreng (Banana Fritters) post. Do give it a try. Yam Nian Gao Fritters - a Chinese New Year crispy treat of new year cake sandwiched between slices of taro (a.k.a yam) and sweet potatoes dipped in batter. Trim taro and sweet potato slices slightly so that they are approximately the same size. Sandwich a slice of nian gao between a slice of taro and sweet potato. Repeat with the remaining nian gao, taro, and sweet potatoes. Mix all batter ingredients in a large bowl until a thick and smooth batter forms. Place crushed rice cereals on a plate. In a medium sized sauce pan, heat about 1 inch deep oil. 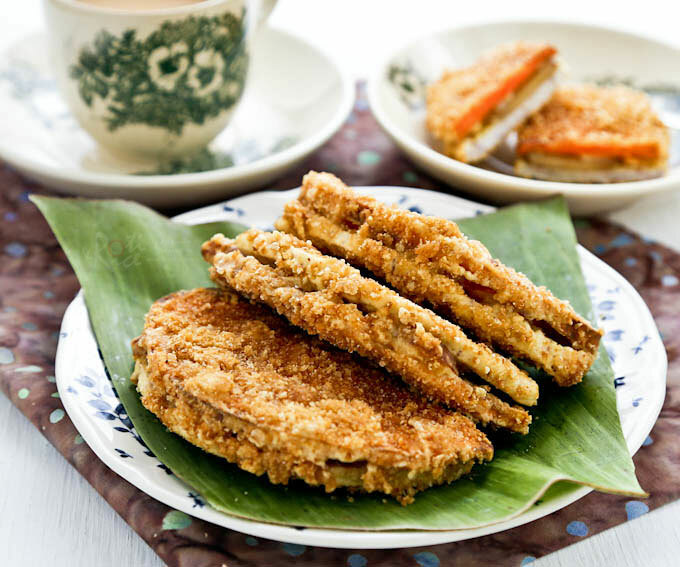 Dip sandwiched nian gao into batter, remove, and coat with crushed rice cereals on both sides. Gently lower into hot oil. Fry until golden brown, turning once. It will about 2 to 3 minutes on each side. Fry in 2 batches. Remove and drain on paper towels. Serve immediately. Oh, I miss the nian gao too!! I have a small nian gao that I had my mum saved for me. Each year at chinese new year, it appears as a table decoration. My favourite way of eating nian gao is the steamed version, rolled in salted fresh coconut shreds. I could eat tons of these! Xin Nian Kuai Le to you and the family with much happiness, good health and prosperity for the year. I made some of the steamed version as well with frozen grated coconut. Unfortunately, that is the only kind of grated coconut I can find here and I am a little cautious about using it. I did however warm it up in the microwave. Thank you for the well wishes. Wishing you and yours a very HAPPY, HEALTHY, AND PROSPEROUS YEAR OF THE HORSE! I am not sure why your niangao melted during deep frying. Perhaps it is the quality of the niangao itself. We have always made this (as far back as I can remember) and never had the problem you described. Make sure to sandwich the niangao between the taro and sweet potato slices. I have kept the niangao in the fridge after i bought them from the supermarket. I used it two weeks later. Would putting them in the fridge instead of storing them at room temperature cause the difference? It takes me some time to peel, slice and sandwich the sweet potato with the taro and niangao. When I am ready to fry, the sweet potatoes have turned black/brown. Would soaking them in cold water help?